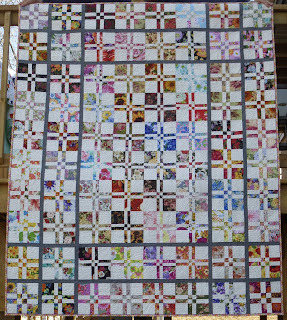 We finally got some sunshine, warm temperatures and low wind speeds, perfect for taking pictures of finished quilts. 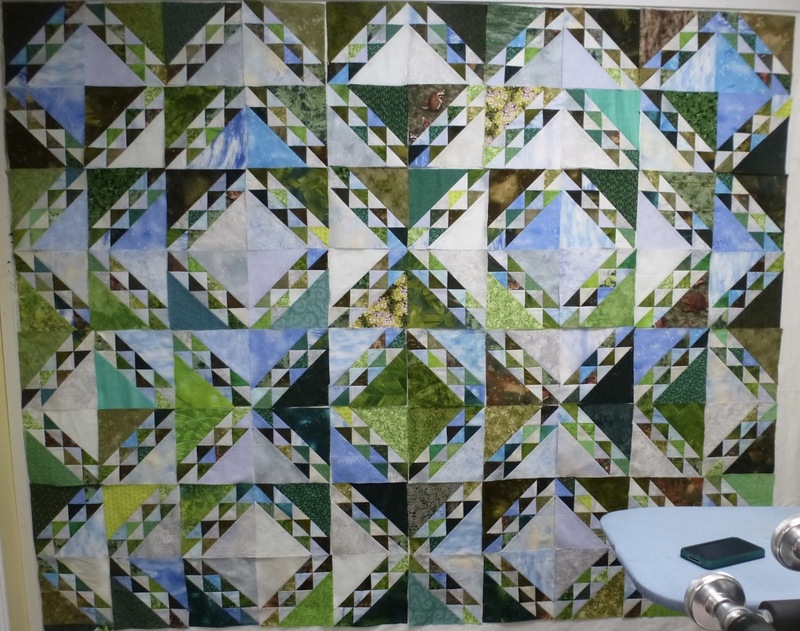 I’ve been working on this quilt, along with Jannette, since January of 2015. We were doing it as a block swap. Each month we chose 4 large scale floral fabrics, and made 2 disappearing four patch blocks from each fabric. We kept one and swapped one, ending up with 8 different blocks each month. We decided to take the summer months off, so we ended up with 80 blocks. Mine is now quilting and bound and counts as this year’s third finish. 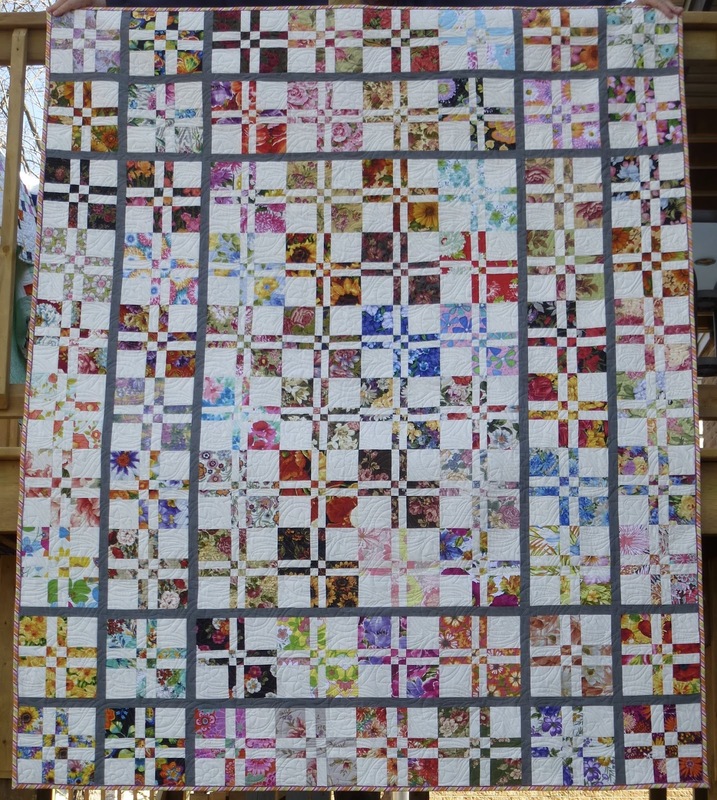 Here’s a closer view of the quilting. I used a new pantograph called Persian Paisley. And as usual, I used a faux piped binding with a diagonally striped fabric for a great machine sewn finish. 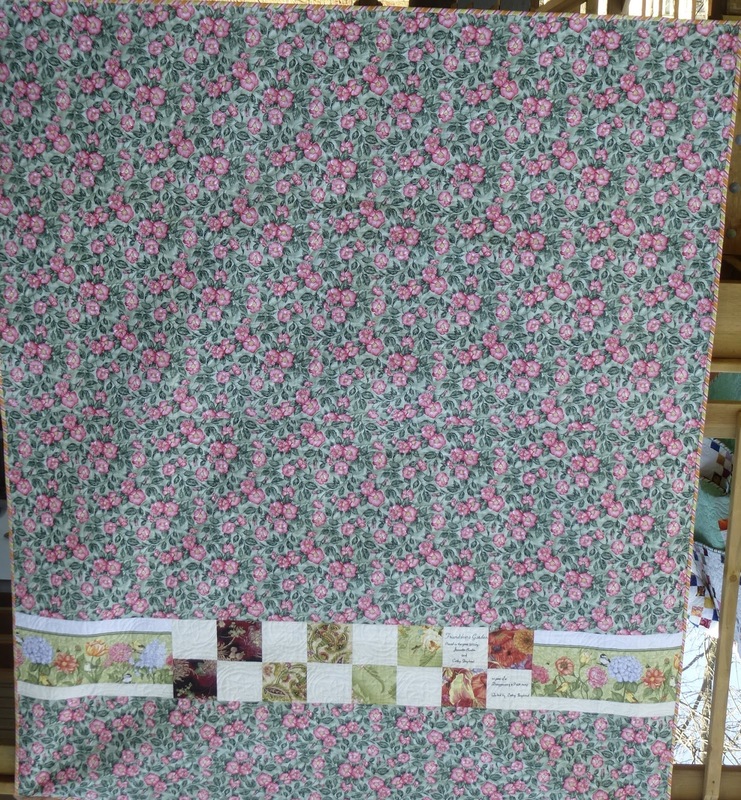 I found a large scale roses print in my fabric stash which worked great for the backing. 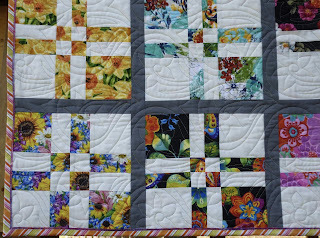 I had a few blocks left over, which got pieced into the backing, along with a border stipe that I thought fit with the theme and feel of the quilt. I even wrote a label on one of the leftover four patch blocks. Considering I hardly ever remember to do labels, that’s an accomplishment. 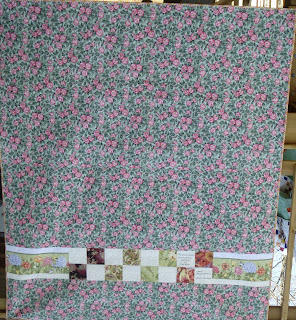 Because of this quilt being done with a friend, I’ve named it “Friendship’s Garden”. Thanks Jannette, for a great year of swapping. I can’t believe how fast the year went. I’m linking up to Lorna’s Let’s Bee Social. First off, before anything else, I want to wish everyone a Happy Easter. He is risen! Praise the Lord! Here’s a great song for this Easter Sunday. I’ve been working a bit on my La Passacaglia again, and I have one of the borders almost finished. It took a bit of pondering to figure out how to get these borders on. I ended up laying the quilt out on a large table and chalking in the straight lines on the top and bottom of the quilt. Then I chalked in lines down the sides, making sure that the corners intersected where they would be hidden behind the quilt top in order to be able to mitre the corners. 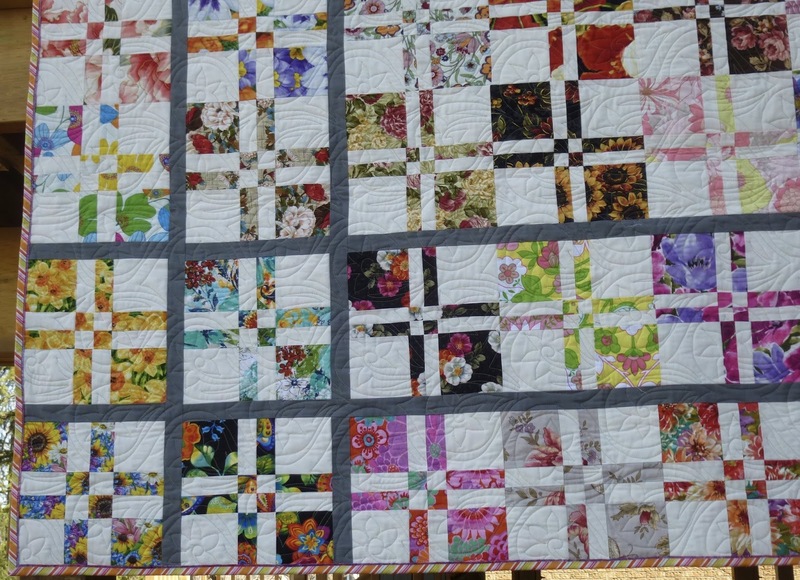 After that, I had to figure out how to transfer the chalk lines, which were on the front of the quilt, to the back of the quilt in order to have a straight line guide for pinning the borders on. I ended up doing basting through the chalk line so the thread would show on the back, and used that as my guide. Then there was more pinning and more basting to make sure nothing moved or shifted while I was hand stitching. I’m totally winging it here, so I hope everything lays flat and even once I’m done.Right now, the body of the quilt is looking fuller than the border fabric, due to all the seams. I’m hoping a good pressing will fix that. I had a small amount of stash used this week, for the binding of a quilt. Past that point, nothing has changed since the last stash report 4 weeks ago. I’m linking up to Judy’s Stash Report and Kathy’s Slow Sunday Stitching. After that, I’ll spend a little time for stitching before our Easter supper. 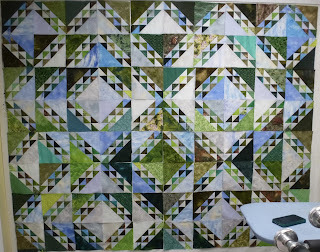 I’ve done some rearranging on the design wall, and put up my Northern Tree Line quilt. I wanted to get an idea of the distribution of the lights and darks, and also find out how many more blocks I need. There are 81 blocks finished, which leaves 19 to go. I’m wavering about what to do with the darker shades of the blues and greys, whether to group them together, or keep them spread apart a bit. It’s tempting to put the darker blues together around the outer corners or in the areas where there are four together. I’ll have to let that one simmer and maybe move things around a bit and take some more pictures to get a better perspective. I did discover that the darker shades of the blues have to be up against the darker shades of the greens, or the design layout gets a bit muddy. I can actually see a spot just up to the left of centre where there isn’t enough contrast. That’s the bonus of taking a picture, rather than seeing it in person. The idea behind the quilt is to re-create the colours and feel of a walk through a forest in Northern Ontario. I’m linking up to the Canadian Needle and Thread Network and also to Lorna’s Let’s Bee Social. Lorna’s another Canadian blogger, and she’s actually going to be coming to speak to our guild and do a workshop next November. That will be fun! I’ve been absent from blogging for over 3 weeks. Two days after I wrote my last blog post, I ended up sick with whatever that nasty virus is that’s going around. And it is indeed a horrible nasty one!! Three days stuck in bed with a fever, and then almost two weeks stuck on the couch with no energy to do anything other than change the channel on the TV and cough. However, I’ve been back to normal for about a week now, and trying to catch up on all the work I missed while I was sick. I finished off a quilt of my own that was on the machine. However, I don’t yet have a picture. It’s been too cold and too windy to get outside for a good one. I did get the binding cut for it today, so it might have binding on it by the time I’m able to get a picture of it. I have two others that have been finished in the last couple of months also waiting on pictures. The first nice day we get, I’ll do them all at once. In the meantime I’ve been working on a quilt for Gail. It’s a bunch of really cute chickens. I’m pretty sure they are Lori Holt patterns. It’s getting a custom quilting job done on it. Feathers in the chicken, a kinda paisley type design in the wing, wood grain for the sides of the nesting boxes, and pebbles for the background. It should be done tomorrow. By the way, anyone reading this who is waiting for me to do one of your quilts, I’m running about three weeks behind what I would have told you when you dropped them off. So, that’s it for the update and I hope to get back to a semi-normal posting routine again real soon.